This is a step-by-step tutorial to describe the process of adding watermarks to images. Watermarks may be any comments or your company logo. Watermarks prevent images from being stolen from your web site. The most common example is a recipe blog or site. 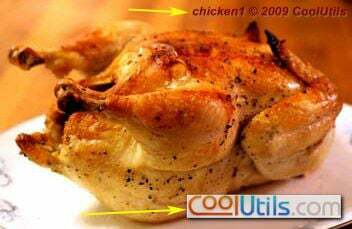 You've cooked a fantastic chicken and want to upload a photo of the dish to your blog. To prevent unauthorized using your image you should add a watermark to it. 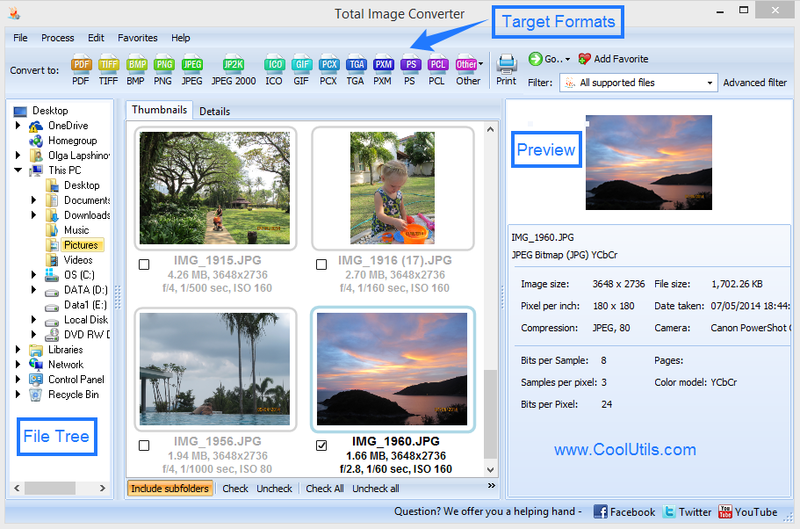 Learn the easy steps to do that if you use Total Image Converter. Total Image Converter adds any kinds of watermarks: text with effects, logos, images, anything you like. First, download and install Total Image Converter. Open the main window. Follow 3 simple steps: select the folder from the file tree, tick the photo and press Watermark button. After you selected the destination (the folder for your output image) you may add logo to your photo. Adding a logo is necessary for corporate images. Tick Add Logo to the image and select the image from the tree. You may type in the path to the image manually. Total Image Converter allows adding effects to your logo. For example you may add a shadow to your logo or make it a bit transparent. Choose the position of your logo (top left, top right, bottom left, bottom right) and jump to the next step. Here you may add comments to your image. Comments include any text you may want to add. That can be the date, the url of your site or any memo you would like to see on your image. 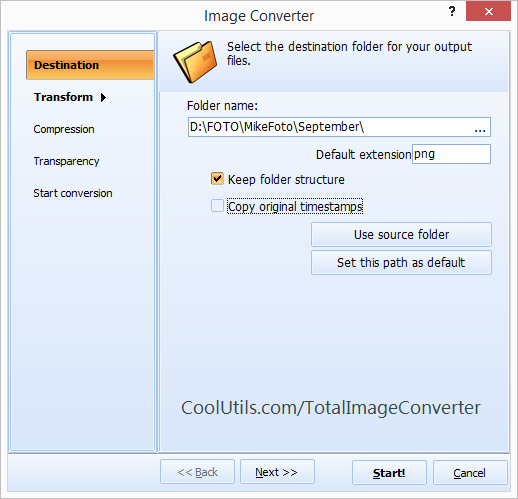 By default Total Image Converter will add the name of the file along with the year. This template is good when you watermark several images in a batch mode. Sure you may change the template to your taste. 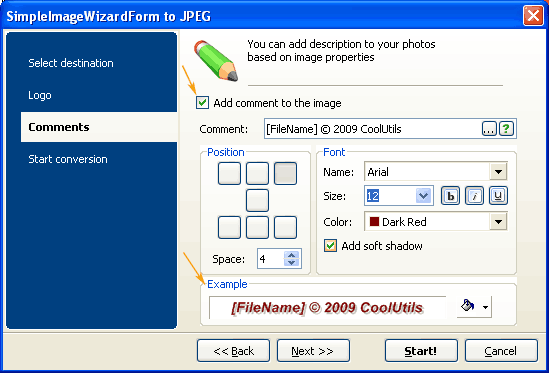 Total Image Converter allows selecting font, size and color of your comments. You may add background color as well. Now you know that adding a watermark is a simple thing if you use Total Image Converter. It's very flexible and you can adjust your watermark to your image perfectly. 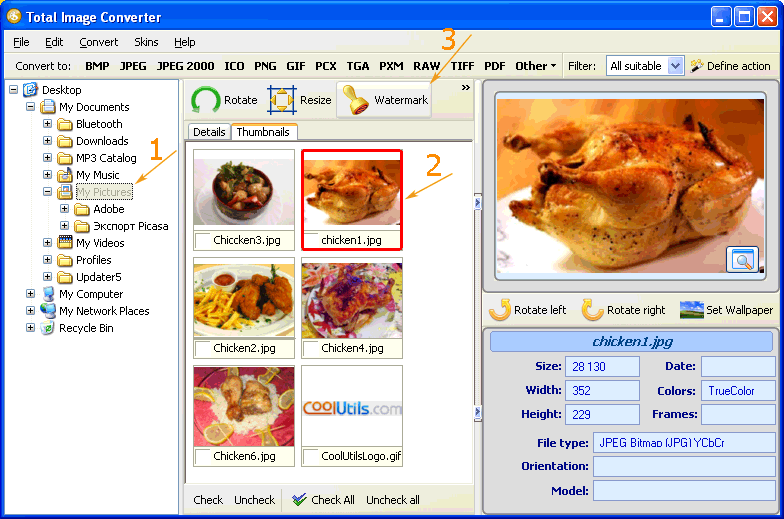 Download your copy of Total Image Converter and start adding watermarks. P.S. Total Image Converter converts images to TIFF, JPEG, BMP, PNG, ICO, PXM and other graphic formats, resizes images, crops and rotates them. Get this user-friendly all-in-one solution now!